Bluetimes powerbanks use USB Type C technology for modern connection and Qualcomm quickcharge 2.0 for faster charging. Bluetimes power banks are the first power banks to offer both Type C and Quick charge. The powerbanks can charge any USB type C device including both smartphones and Laptops with type C. The battery capacity for the battery packs is 10,000mah. Bluetimes shows their latest Intel Cherrytrail Mini PC on CES2016. It is powered by Intel Atom X5 Z8300, 2G RAM, 32G flash, with 4 USB port and VGA,HDMI dual display, runs Dual OS with Windows10 and Android4.4, support 2.5''HDD and SSD. Bulk price at $80 for 1000pcs. Sample will be ready at end of January 2016. Bluetimes shows their fast charging power bank with their own BQC technology and Qualcomm 2.0 quick charge technology. The Bluetimes BQC technolohy supports full-charging 4000mAh battery in 15 minutes, it takes 3 hour to full-charging 4000mAh battery by normal 5V/2A power supply. iThink Smart WiFi Camera with 720P 135degree camera in , support live video streaming from smartphone, 2-way video conference call, local video recording to Micro SD card, automatic alarm if there is people movement. Infrared night version is also supported for iThink HandView2. Bluetimes shows their sparkling new design power banks with bluetooth selfie camera buttons, $18 and $35 Ithink IP Camera with motion monitor through mobile phone, 720p recording, support WiFi, 4G network. Bluetimes is also launching their $60 Intel dual core mini pc. Bluetimes sells about 40-60 thousand power banks per month. Shenzhen Bluetimes Technology Co Ltd presents their latest Set-top-boxes (contact below for samples) such as Realtek RTD1195 ($30-$60 depending on designs for samples), Rockchip RK3288 ($50 samples in HDMI Stick), AmLogic M802 ($79 on Bluetimes B2C websites (2)) and Allwinner A80 Set-top-boxes (samples to be available for $80 next month). If you are a dealer, you can send an email to sales4@ebluetimes.com to get the best price and professional technical support. Bluetimes makes set-top-boxes based AmLogic, Rockchip and now also shows their new Realtek 1195 ARM based Set-top-box solution to be priced from $29 to $69 to be releases soon for HD Media Player, OTT streaming player, Android TV box, Miracast wireless Display Adaptor and more. Realtek 1195 features 4K H265 decoding, FHD decoding and encoding with multiple formats, wireless and wired Networking, Hdmi receiver. You can watch my Bluetimes Factory Tour video here. 2. By Realtek Audio DSP and Bluetimes design DAC with Hifi sound support DTSHD,True HD and Dolby Digital Plus and other popular formats .VEDIO and Audio Dsp with HW acceleration . 4. Integrates Gigabit Lan and support NAS function . If you are interested in more information about Bluetimes Set top Box based AmLogic, Rockchip and Realtek based products pls email sales@ebluetimes.com OEM/ODM inquiries are welcome. Bluetimes and Realtek launch a wireless transmission screen solution based on chip RTD1185 system & RTL8192DU or RTL8188CUS Wifi chipset. 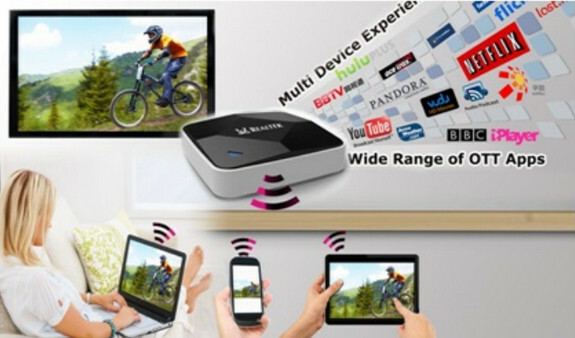 This works with consumer products such as computers, tablet, mobile phones and provides Miracast, DLNA, Intel WIDI to satisfy users for portable devices with larger screen with high quality and low latency between the wireless transmission of screen application demand. 1. RTD1185 system chip and RTL8192DU double-frequency 2 x2 wi-fi chip set of wireless transmission solution to become the first screen Miracast certification test platform. • 2. BOM highly integrated DDR (ETN, HDMI, 128 m). • 3. Support on the market all the Wifi display technology: Intel WiDi, Miracast, DLNA, as well as the self-developed Airfun. , 4. 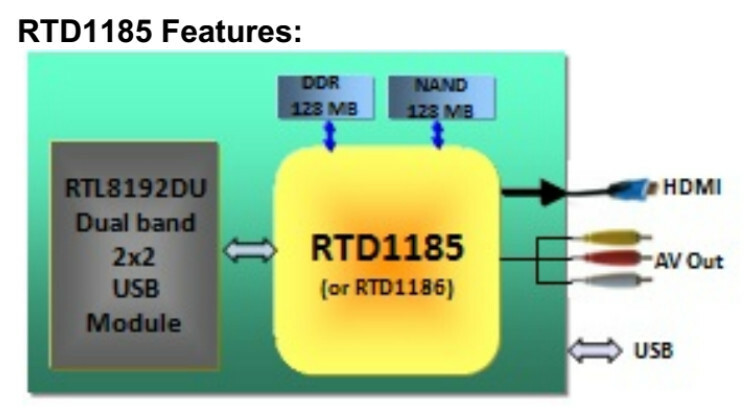 RTD1185 format for the whole decoding multimedia chip, IC leading manufacturer for the multimedia player, so-called Full hd media player can encode any formats with movie. • 5. Membership Realtek netcom department, to provide a complete set of main chip and the Wifi chip solutions. • 6. Strong BLUETIMES FAE engineering team to provide hardware/software engineering support. 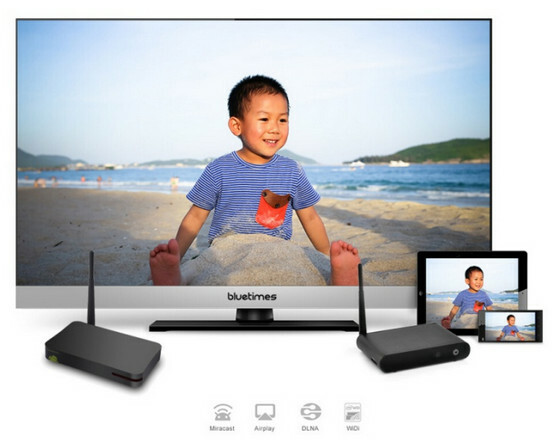 If you are interesting with Bluetimes Mircast Full hd media player or other product pls email sales1@ebluetimes.com. Direct phone line +86 755 27318811 to Alex Dou. BlueTimes shows some of their Power Banks in different colors with 10000mAh, 5000mAh. BlueTimes also shows their $14-$16 Miracast Dongle based on the Actions AM8251 (you can buy a sample for $20 including shipping). Watch my tour video at the BlueTimes factory here. Shenzhen Bluetimes Technology Co., Ltd maker of Android TV box, Miracast Dongle and Power Bank shows around their 4000 square meter factory featuring 4 high-speed SMT Lines, 2 wave soldering Lines, 4 testing and assembly Lines, aging test room to enable the output of 500,000 Power Bank and Android TV box per month. 80% of BlueTimes products are exported to Europe, USA and Southeast Asia. 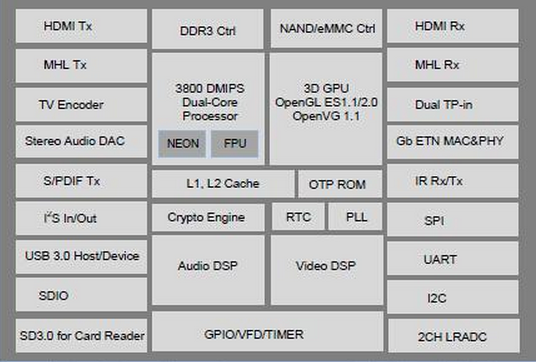 BlueTimes features solutions using Rockchip RK3188 and AmLogic M802, with plans for Rockchip RK3288 and more.